A few weeks ago Which Beauty Box UK ran a Instagram competition with Pink Parcel to win a 3 month subscription. I absolutely love following Which Beauty Box UK's blog; her sub box reviews are always well photographed, she explains what's in the boxes, what the different boxes are about and prices too! She also pops a few sneak peaks of boxes up on her social channels and blog every month. I was lucky enough to be one of the two winners of a 3 month subscription to Pink Parcel which is fantastic! I was so excited to receive my first box which arrived so quickly and before my chosen date of the 10th of the month. 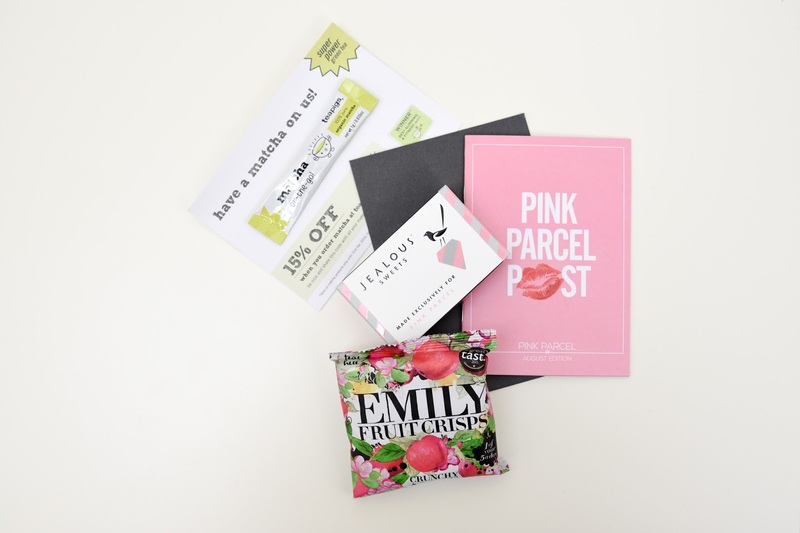 Pink Parcel is a monthly subscription box that supplies us ladies with the discrete items we need on a monthly basis as well as some lovely treats to help us get through that time of the month. You have a choice of 3 monthly delivery dates; pick the date which best suits your cycle so you have your items in time for when you need them. I think this is a fabulous idea for a subscription box, it gives us ladies a treat every month and provides us with the necessities we need without going to the shops or even leaving the house if we don't want too. The "For You" box or treat box as I call it, is the most exciting part of the box and this months was filled to the brim with some awesome items. Inside the treat box was; three foodie items, three makeup items, one skin care product and a jewellery treat too. During the summer months Pink Parcel avoid sending chocolate in their boxes to save any melted messes arriving through our letterboxes. This month they featured Jealous Sweets which the packaging has been designed exclusively for Pink Parcel; I love the pink and grey candy stripe on the box. Inside the box was a small packet of Grizzly Bear sweets that are vegan and gluten free. The sweets are very very sweet and fruity, I thought I would of eaten them all in one sitting but I didn't because they was so sweet. They are a soft jelly texture and come in a few flavours including; apple, orange, lemon, blackcurrant, raspberry and pineapple. I could definitely taste the blackcurrant and orange flavours but the pineapple flavour was my favourite. First of all how lovely is this packaging??? So colourful and bright it makes such a great photo prop that I didnt want to eat them, haha. However of course I did tuck in and found the apple crisp to be very flavoursome and surprisingly pleasant; I don't usually like dried fruit snacks like these. I was really pleased with the look, texture and taste of this little sweet treat, I will be buying more. I've never drank or liked the taste of tea, or coffee for that matter; I just don't really like hot drinks. So I haven't tasted this item for that reason but instead passed it onto a friend for her to enjoy. From what I've read this Matcha tea is equivalent to around 10 cups of normal green tea and can help improve concentration and support the immune system which would really help me if I drank tea, I hope my friend enjoys Teapigs. This is super product for summer and great for popping in your bag for touch ups throughout the day. This brush and bronzer duo is a nifty product, take off the lid and pull down the cap to expose the brush then press the button on the other end to release the bronzing product, this makes the product really easy to use. The bronzing powder leaves a bronzed glow, good enough for any night out or event and the product blends out really well. You only need to push the button once to release enough product to apply all over your face and neck unless you want a more bronzed look. I absolutely love So Susan products so I was really pleased to see this highlighting pencil in my box. The Haute Light Pencil leaves a lovely highlight under my brows which is where I've mainly been using this product. It's so easy to use as well with being a pencil design, I'd love to see more products from So Susan in my next few boxes. This pencil is a new launch, is of course 100% cruelty free and includes white truffle extract. The shade is a pink highlight with does work perfectly under my brow line, I have tried it on top of my cheek bones and down my nose, I used a brush to blend the product out on these areas and it looked great. I think this is my favourite product in this months box! I've tried one Cougar product before and it was just ok in my opinion so I eager to see if this product was the same. This 24 hour liquid lipstick is definitely what it says on the tin, 24 hours long lasting lipstick! The lipstick applies wet and soon dries leaving a matte finish on my lips. 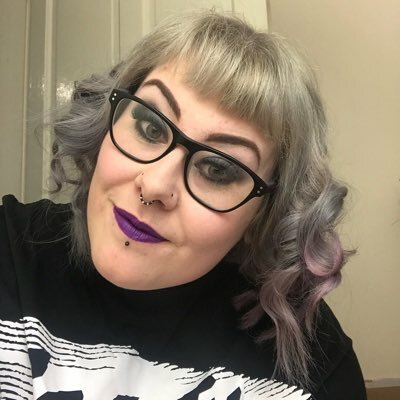 Once dried the lipstick doesn't budge for nothing, I did even struggle a little to remove which was a slight annoyance but I was happy that my lipstick lasted all day throughout eating and drinking. I love this shade too, Mulberry is a purple colour which of course I love being the purple fan I am, this is a shade I could wear during the day or night. I really like the idea and results of this product from SASS; it's a skin concentrate that helps to prevent ingrown hairs, reduce hair re-growth and soothe post-shave/wax skin. I've found it has helped to prevent ingrown hairs and has stopped the re-growth itch that sometimes occurs too. The product is a gel like formula which soaks into the skin beautifully leaving a lovely citrus scent although I can smell a slight hint of cucumber too. After applying my skin felt soft to touch and continued to feel soft after, I would highly recommend this product for the quality and results I have achieved. There was three different bracelet designs featured in Pink Parcel this month, I received the black and white bracelet which I was so pleased with. I've loved wearing my bracelet since receiving my box, it looks great with everything with being plain in colour. Each of these bracelets are designed and hand crafted in London; there's even some 3D printing involved which really perked my interest. My bracelet has little sliver details linking the black and white material together and a sliver cube as the fastening feature; this is really is a well designed and fashionable piece of jewellery. I am really pleased with the contents of this months box and can't wait to receive another two boxes from my competition win, il be thinking about signing up monthly after the next couple of months too. Il be popping another review up of next months box once I've tried everything, so check back next month. If you fancy signing up you can do so here, your first box is just £6.99 and then £10.50 including postage and packaging thereafter; you can then enjoy monthly treats plus the necessities you need straight through your letterbox.